7000 BC will have a table at the NM Youth Unite: Poetry Showcase 2008 event, featuring youth poets from Santa Fe Indian School, Hands Across Cultures, Warehouse 21 and others, at Warehouse 21 on Friday, November 7 from 7:00-9:00. We’ll have comics from group members available and be spreading the word about our workshop at W21 on Saturday, December 6. Admission is only $15 for both days. The Cartoon Art Museum, Dark Horse Comics and Sparkplug Comic Books proudly present The Cartoon Art Museum’s Alternative Press Expo Party on Saturday, November 1, 2008. Join special guest Keith Knight as we host the closing reception for The Knight Life: Bay Area Spotlight on Keith Knight. Additional guests include Jesse Reklaw, celebrating the release of The Night of Your Life, published by Dark Horse Comics, collecting the Ignatz Award-nominated webcomic Slow Wave; Trevor Alixopolous, creator of the Ignatz Award-nominated graphic novel The Hot Breath of War; Hellen Jo; Olga Volozova; David King; and Julia Wertz. Hellen Jo and Olga Volozova will be signing copies of their own newly-released graphic novels, published by Sparkplug Comic Books. All of the aforementioned artists will be reading selections from their comics, as well as signing copies of their new books and selling limited edition prints and posters. Food and beverages for the event will be sponsored by Dark Horse, Sparkplug and a wide selection of local restaurants and merchants. Please visit our website the week prior to the Alternative Press Expo for a complete list of party sponsors and special events. when: Thursday OCTOBER 30, 2008. 6:30 pm to usually sometimes between 9 and 10 pm. For this JAM will be finishing up some older work as well as attempting to do an interactive/choose your own adventure comic , so come with your imagination and favorite drawing tools. There is also a good chance that we will have examples of the books being sold at APE as well. Some of you out-of-towners will be in town for APE, so drop on by and say ‘Hi’ to your Cartoonist Conspiracy San Francisco pals. The jam is FREE but it’s nice if everyone could purchase something from the café we meet at so we don’t wear out our welcome. Thanks to all that helped celebrate the one year anniversary of our off-shoot, rebelious, trash-talking St. Paul cell by jamming out at Cosmic’s Coffee on October 16th, 2008! We even had a newbie show up, which is always nice to see! Please, show up next time too! In fact, bring your friends! Last October, Kevin McCarthy, Bud Burgy, and myself (Daniel Olson) met at Cosmic’s to crank out a four page jam entitled “Tussles and Tights” – an homage to the great Muscles and Fights anthology. This year, with Kevin (now living in Milwaukee) and Bud (now living in a cave somewhere?) gone, I was the lone original. Although I was not alone! Scott Gallatin, Ryan Dow, Meredith (didn’t catch your last name), Roy T. Cook, Jon Sloan, and Tom (still can’t remember your last name) joined me as we descended upon the coffee shop to jam out and possibly rumble with some LARPers. To those that showed up this past month and those that have joined us before, I thank you. As stated in the past, any and all are welcome to join us! An update on the status of the Milwaukee Cartoonist Conspiracy/Cream City cell…..is still forthcoming. Hey, McCarthy and Amado we’re still waiting! Want to start up your own cell? It’s easy! Just follow this link: Start a Conspiracy in Your Community. Are you one of the many rival cells that we trash? Perhaps you are a LARPer and would like exact some “internet revenge.” If so, maybe you should do something about it and post something here. You should really know all of this stuff by now. 24 Hour Comics Day was a big success at both Harwood Art Center in Albuquerque and at Warehouse 21 with the assistance of True Believers in Santa Fe. We had 24 “official” participants in Santa Fe (28, including folks who were working on other projects), 13 of whom finished 24 pages before the end, and 24 participants in Albuquerque (plus one blogger) with 8 completions. Hour-by-hour posts from Albuquerque (Q-Town) are at 24hcd.blogspot.com as well  but they also had their own dedicated blog at 24 Hours in Q-Town. 24 Hour Comics Day is a completely volunteer-run event, so we truly appreciate the donations from Walter Burke Catering, Java Joe’s, Upper Crust Pizza, La Montanita Co-Op, and BAWLS, the official energy drink of 24 Hour Comics Day. And thanks to the Santa Fe New Mexican for their article on the Santa Fe event, which printed while it was still going on. 7000 BC’s The Comic Story, an exhibit about creating comics, will run at the Albuquerque Main Library through the month of October. Work from a wide variety of 7000 BC members will be shown, with an emphasis on the process behind five different stories. A demonstration of the process will be held on Saturday, October 25th, from noon to 2:00 pm. For more information, call 505 768 5141. 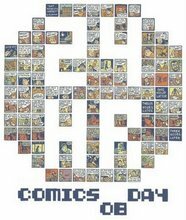 A lot of fun was had in Minneapolis last weekend for 24 Hour Comics Day… if you haven’t already seen it, go look at the Minneapolis coverage on our event blog here. 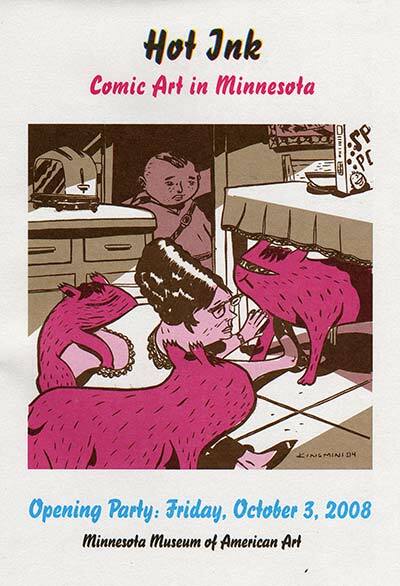 Ryan Dow, Dan Olson, Kevin Cannon and Zander Cannon have all posted their comics… go here to get the links. We will be collecting the comics as a mini-comics set… go here for more info on how to participate in that. Get some sleep and start mentally preparing now for next year. Heidi MacDonald at The Beat has the info. The Hot Ink: Comic Art in Minnesota show at the Minnesota Museum of American Art just got a great write up in The Star-Tribune (and Vita.mn). Note that the article is 3 pages you have to click through to read. A populist complaint about the contemporary art scene is that artists today “can’t draw.” More to the point is that those who can draw have probably turned to cartooning. For anyone who appreciates great drawing, this show is a good place to find it. You can check out some photos from the opening of the event here and here (thanks to Big Time Attic for pointing these photo galleries out… you can see a image of the print version of the article on their site)… please let us know if you see any more we can link to. Also, if someone could save a copy of the print version of the above article for me, I would much appreciate it! Note also that if you haven’t seen the show, it apparently is going to be up until around March 2008… so you have some time. Creating a 24 Hour Comic Book means trying new crazy things. Here are some on-line tools to help get some ideas. If you will not have web access during the challenge you can always print out some and then pick one at random. Samples: A therapist watches TV with a monk in a yogurt shop, Ravishing street performers discover their true selves. Samples: Don’t be afraid of things because they’re easy to do, Do we need holes?, What mistakes did you make last time? Seventh Sanctum – Random Name and Ideas – Here you’ll find tools for writers, gamers, and artists; randomly assembling names, concepts, and more for when you need inspiration, or just a bit of amusement. Samples: Superheros, RPG characters, Names, etc. Random Plot Generator – Random fantasy/epic plot elements Sample:Advice for the Hero: If I maintain a secret identity, I will keep my transformation ritual as simple and quick as possible so that I cannot be interrupted during it.